This tangy and spicy authentic Eurasian curry comes directly from the Malaysian village of Portuguese Settlement in Malacca. 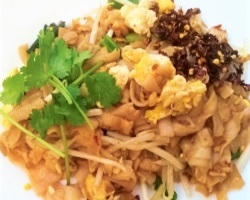 It is bursting with the flavors of lemon grass, coriander, ginger, onions, garlic and vinegar. The perfectly tender potatoes completes the flavor infusion. This dish is usually served during Christmas and special occasions. It can be made with chicken or pork. Add dried chillies and stir for a few minutes. Before removing from heat, add turmeric, coriander and mustard seed powder. Keep stirring to prevent burning. Cool slightly and place in food processor. Grind until fine. If making paste ahead of time, may freeze for up to 1 month. Add meat and potatoes into pan and let slightly brown. Stir often to prevent burning. Add a little water if necessary and let simmer until meat is mostly cooked through. Add vinegar, soy sauce, fried ginger and salt and pepper to taste. Add chunky onions and fresh chillies and let boil once.